Halal is the arabic word that means “lawful by G-d.” Unity Brand Halal Products produces and markets meats and poultry products, which have been prepared in accord with Islamic standards. As religiously specified, Halal foods can only be produced by persons qualified to perform the lawful process and requirements pursuant to Islamic law. The production of Halal food for Muslims is analogous to the production of Kosher foods by and for Jews. The slaughtering and processing are similar in operation and intent. Unity Brand Halal Products consists of beef, poultry, lamb and goat products. 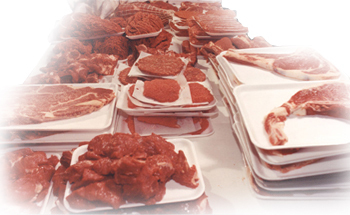 Concern and assurance of providing the healthiest form of meat is maintained when preparing all halal products. The Halal process is free of pork and pork derivatives. Unity Brand Halal Products, Incorporated ensures that the livestock is NOT fed nor fattened using antibiotics, sulfa based drugs or other non-organic additives. Livestock are slaughtered so as to drain all fluid from the animal. The Islamic concern for cleanliness, purity and health in producing these foods emphasize the importance of blood and the fluids as the physiological transport system for toxins, poisons and other impurities. The Halal slaughtering process also ensures that the animals do NOT suffer from pain and torture. The American meat producing industry is fraught with technical problems and complications regarding disease, cleanliness, preservatives, storage and transport that leaves many buyers deeply concerned with the products that are currently available in supermarkets. American Muslim and all health conscious consumers face difficulty in choosing food items because of the lack of availability of “lawful” food products. The great demand for “clean” meats by an ever growing health conscious population makes “Halal” food a necessity in today’s market. Therefore, today’s consumer will benefit from consuming Unity Brand Halal Products. Unity Brand Halal Products, Incorporated is distinguished as being one of few companies in the United States of America able to offer Officially Certified Halal products.